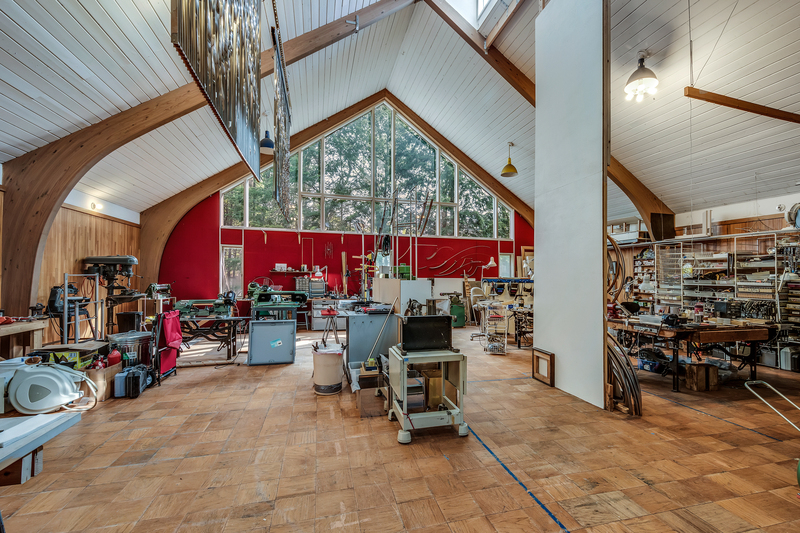 Image of Ihara's home studio in his Concord, MA home (above). Michio Ihara’s brass and stainless sculptures are on display the world over. The metal geometric shapes have a lightness and movement that belie the materials from which they are created. The sculptures take many forms from wall-mounted or suspended to those incorporating wind and kinetic elements. Barrett | Sotheby's International Realty is fortunate to be listing his incredible 4,383 sq. ft. studio and 3,255 sq. ft. home in Concord, MA where he has worked since 1981. To see this amazing property; visit our website here. His visually exciting sculptures can be found in corporate parks while others are displayed in hospitals, places of worship, and natural outdoor spaces. Highlights of his breadth of work with photographs of wall, suspended, wind and kinetic sculptures in situ may be seen on Ihara’s website. Check out the most recent article about him in Huffington Post. His work allows viewers and observers a moment of peace in their day while providing visual stimulation that changes and engages the viewer anytime they have the pleasure to see it.